My top five favourite apps for getting around Paris (and they are all free as well!). I use this app every single day. The best function is the route planner. You just plug in your start and end points (the address or metro station) and Bob's your uncle, it'll give you the exact directions (metro, train, buses, trams - whatever you select although I tend to stick to the metro because there is less chance of getting lost that way) of how to get there. It will also estimate the time needed to arrive at your destination (I always add on an extra 5-10 minutes for delays/wrong turns). To double check, rule of thumb is to allocate 2 minutes for every station and 5 minutes for each station change to be on the safe side. Best of all, the app is available in English and there are always three options to choose from: fastest, least amount of walking and least amount changes. This app is similar to the RATP app but it covers the RER train. Good for cross referencing as sometimes taking the RER is much faster than the metro (think line A to get across town vs line 1). Also good when you need to travel further out of zone 1 and 2. Also good again when the RATP app decides to play up. This is my newest favourite app. It was only recently released and is the Parisian version of the London app Tube exits. This app will tell you exactly which carriage to hop into in order to minimise your travel time by lining it up with whichever exit you need at the next station whether it's to exit the station or change metros. Brilliant work. I love it! With this app, as soon as I get off the metro I'm automatically aligned to right exit to get out or to change lines! While I'm waiting for the metro to come, I consult the map and start walking up or down the platform in order to get onto the right carriage. Of course this would appear in my best 5 list. Seriously what on earth did we do before google maps?! Although the answer is that we probably used our brains to read um.. real maps. But then again it's hard to deny that this app is indispensable (except when it lags and doesn't tell you you're walking in the wrong direction until after 3 minutes of walking in the wrong direction by then you're probably swearing at that inaccurate blue dot). And finally, Uber. Tap in your location and destination, check your estimated fare and wait for your uber. When you're in the car, refresh yourself with the bottle of water and lollies on board and head to your next destination while tracking the route as your credit card/debit card is billed on the spot automatically. There's clear evidence of who your driver was, what route they took and how long they took to get there and on top of that you're also given the opportunity to rate how good your driver was. No waiting around for change to be given or cards to be swiped. Just a thank you and off you go! Despite all the controversy, strikes, resistance from Parisian taxis and violence surrounding Uber in Paris, it's without a doubt that it has its advantages (as long as there isn't any crazy surge pricing involved). Especially when you can get a 20€ voucher to try it out for free. 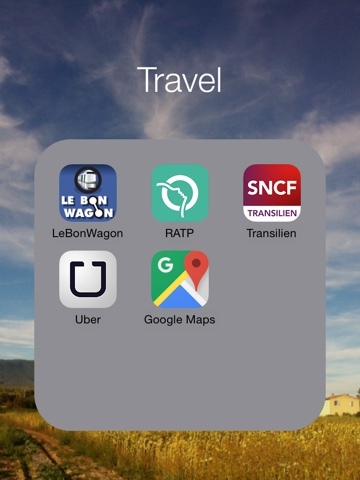 Roll RATP, SNCF and Le Bon Wagon into one and you have Citymapper. Free, works in many other cities and always with up-to-date information, I couldn't do without it! YES! I have used Citymapper! I don't know why I can't seem to warm to it, I think the thing I don't like about Citymapper is that it doesn't seem to save your addresses as well as the other apps? I find that I'm constantly re-typing in locations. Or maybe I don't know how to use it properly! Have you had this problem as well? Haha - I assumed you already knew these apps existed to navigate instead of using the old school method! Can't wait for you to reinstall these apps again! !